The "FORMER" teachings we learned in the past were only under the classifications of "PARTIAL (INCOMPLETE), seeing in the glass darkly, peering through a mist, cloudy picture in a mirror, and the like. We can compare these "FORMER" teachings to the analog type of Radio Technology. Similar to the old Radio Technology, the OLD BIBLE TEACHINGS ARE IN ANALOG, that’s why it is oftentimes confusing, subject to human interference (interpretations), which lead to doctrinal errors and deceptions. Now the time has come for the perfect (complete), the "face-to-face" (direct), the full knowledge of God, and the whole truth about His Kingdom. MESSIANIC KABBALAH HOLDS THE PERFECT AND COMPLETE BIBLE KNOWLEDGE AND WISDOM! We are commanded by the Bible to discard the old, partial, and unclear understanding of the Bible. Now that the perfect or complete Messianic Kabbalah revelations are here, we are commanded to throw away our previous beliefs and understanding of the Bible! And these even include those prophecies or inspired messages that we heard from our former leaders. I said "former" in the sense that they are dead already, or their inspired teaching have passed away with them. During their time, when they are still alive, their inspired messages are appropriate. 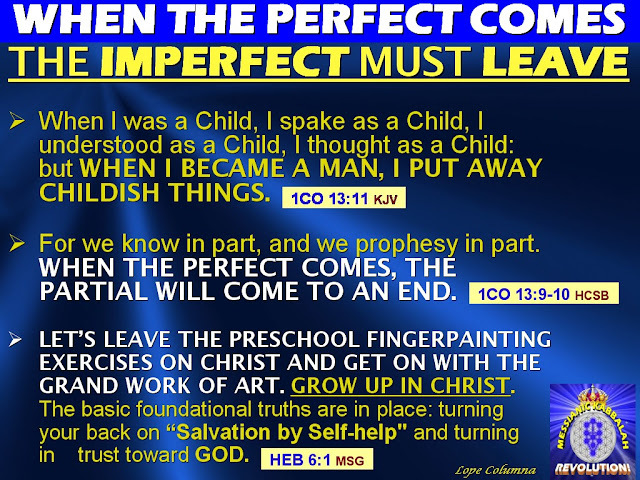 But now, there are lots of new revelations that make those former revelations as childlike or childish! PERFECT = TELEIOS (G5046). Complete (in various applications of labor, growth, mental and moral character, etc.). Completeness: of full age. A NEW MINDSET IS NEEDED TO RECEIVE THE PERFECT KNOWLEDGE AND WISDOM OF MESSIANIC KABBALAH! Similarly, in Radio Digital Technology, we need a new digital radio receiver to receive the clear digital signals. Listeners can use their digital receiver, however, to tune to stations that are not broadcasting in digital. Spiritually, our mindset and attitude must also be converted to a "digital format" for us to receive the Kabbalistic ("digital") messages that God is now broadcasting from heaven to earth. Perfection is really the goal and mission of the True Church, which is in the state of Her Perfection She is called the BRIDE OF CHRIST (Ephesians 4:12-13). Continued on: The SCIENCE AND TECHNOLOGIES OF THE HEAVENS (UNIVERSES) REQUIRE PRECISION AND PERFECTION! Be You Perfect as Your Father in Heaven is Perfect! < PREVIOUS: LEAVE NOW THE EARTHLY BASICS. 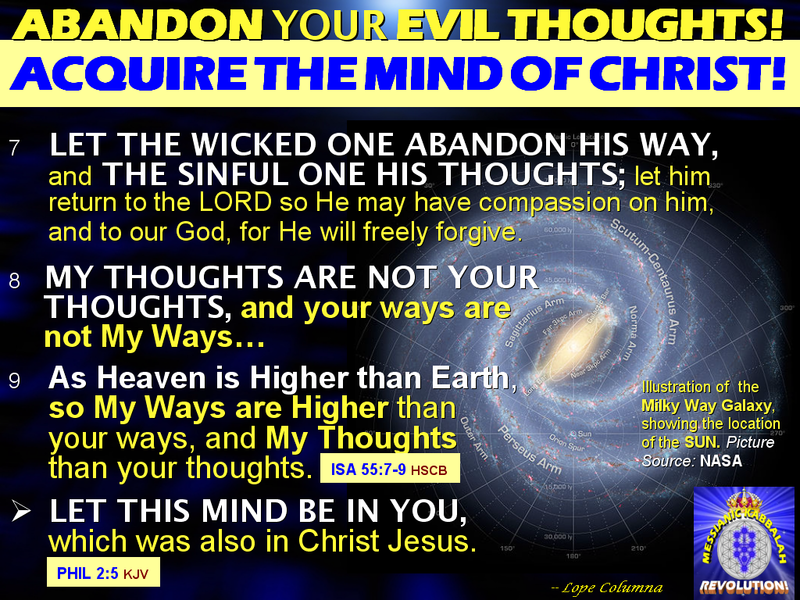 If You Are With Christ, Seek Those Things That Are Above! Because True Religion And Living Faith Now Crossed The Earthly Domain, and is Now Above in The Heavenly Domain! i haz nothing else to say http://www.youtube.com/watch?v=3E-khYKXMhw omfg must check it out! I just found columna-messianic.blogspot.com by surfing online, and found it is so sweet. Keep up the great work! You can also get a tutor to help you. My friend told me he was helped a lot by amazing [URL=http://sgchinesetutors.posterous.com/ ]japanese tutor [/URL]. Can you also share me with your comments found here? me out much. I hope to present one thing back and aid others like you aided me.